This page is for the fan-made remake of Deus Ex. For the original, see Deus Ex. FOV is Vert- BUT: In-game, press ~ and enter fov X with X being whatever you want. Maximum resolution is 2280x1620 (3K). 80, 82, 84, 86, 88, 90, 92; Possible to change via console. If neither works, see Issues fixed. This fix makes the game start in windowed mode rather than fullscreen, so tools like Borderless Gaming can work properly. The game defaults to 16x anisotropic filtering. This value can be modified. A window called Advanced Options will appear. Change the value of MaxAnisotropy to the desired value. Close the window to apply changes. The game uses MSAA and defaults to a value of 8x. This value can be modified. Change the value of NumAASamples to the desired value. 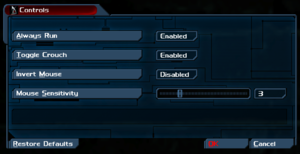 The game defaults to an uncapped FPS. If needed, a FPS cap can be applied. Change the value of FrameRateLimit to the desired value. A value of 0 uncaps FPS. 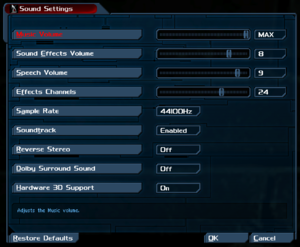 Patch 1.0.2 added Raw Input by default and thus eliminated acceleration in-game. 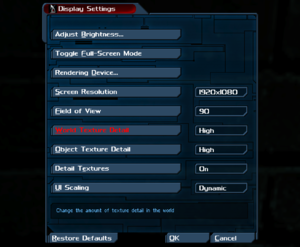 If the game's FOV cannot be set using the in-game options menu, you may need to disable the game renderer's auto-FOV setting. A 64-bit operating system is recommended. ↑ 2.0 2.1 File/folder structure within this directory reflects the path(s) listed for Windows and/or Steam game data (use Wine regedit to access Windows registry paths). Games with Steam Cloud support may store data in ~/.steam/steam/userdata/<user-id>/397550/ in addition to or instead of this directory. The app ID (397550) may differ in some cases. Treat backslashes as forward slashes. See the glossary page for details. 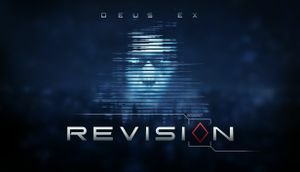 ↑ DoctorJunglist comments on Deus Ex: Revision is now out on steam.